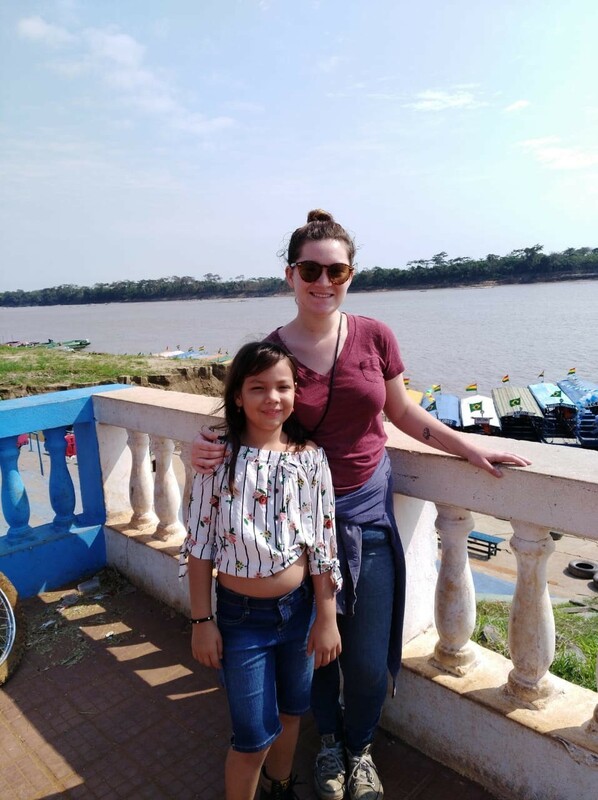 I came to Bolivia as a tourist with the intention to volunteer with a non-profit organization, but with no set plans and having done very little research. You could say I was a bit unprepared for my trip; in fact, I had to get the yellow fever vaccination here in Bolivia because I had not been planning on wandering so deep into the Amazon. The point is, when I made my last-minute plans to change course and head to Riberalta and volunteer with SB, I was very clueless about many things and had no idea that the first weekend I´d be spending in the capital of the Amazon was also Bolivia´s Día de la Independencia. This actually ended up being great timing for me, since it meant that when I showed up in Riberalta, I could feel the buzzing energy of people preparing for the festivities that weekend. There was to be at least one parade each day Thursday, Saturday, Sunday and Monday, enough so that nearly every member of the community had an opportunity to march in one alongside their school, place of work, or any other community program they might be involved in. My host sister was to march in a parade with her school Thursday morning, so they had been practicing all week. The most beautiful parade I went to that weekend was on Saturday morning, when the marching bands from various schools and clubs performed. (So, so many marching bands. Literally the entire parade was just marching bands.) Boys of all ages carrying drums around their wastes, teenage girls in cute outfits and 6-inch stiletto heels playing the xylophone and twirling batons, huge banners reading the name of the band or school and sporting the colors of the Bolivian flag. Because Riberalta has a very small-town vibe, my host mom (who knows everyone, apparently) must have excitedly waved hello to and even walked into the parade to hug at least 10 people she recognized marching in it. My host mom, wanting to show me the biggest and best Independence Day celebration in the Amazon, took me to Guayaramerin on the border with Brazil for an overnight trip. It did not disappoint; Guayaramerin, despite having a smaller population than Riberalta, has two main plazas instead of one, both of which were fully decked out with bleachers for the people watching the parade, enough plastic tables and chairs to cover the entire street and seat half the population of the town, and stages with DJs playing anything from EDM to reggaeton to traditional Bolivian music. The entire town was red, green and yellow that day, from the shirts people were wearing, to the decorations on all the cars and motos, to the banners hanging from every storefront. It was quite the atmosphere. The bottom line: The Bolivian Amazon does Día de la Independencia right. Both Riberalta and Guayaramerin are of course well worth visiting any time of year, but I am incredibly grateful to have been welcomed to Beni with the sounds of marching bands and the colors of the Bolivian flag.